Just how close can we get to marine wildlife while we are out kayaking? We can get pretty close! This is one reason exploring the ocean environment in a kayak is so exciting. Paddling into areas that larger boats have no access to gives kayakers a unique experience with marine wildlife. Our water craft is quiet, maneuverable, and can navigate very shallow water. This is great for kayakers but is it great for the wildlife we are eagerly wanting to see? Regulations in Canada and the U.S. prohibit the harassment and disturbance of marine mammals. Many species are threatened or endangered and subject to additional protections under the Endangered Species Act (U.S.) and the Species at Risk Act (Canada). BE CAUTIOUS AND QUIET when around haul-outs and bird colonies, especially during breeding, nesting and pupping seasons (generally May to September). REDUCE SPEED, minimize wake, wash and noise, and then slowly pass without stopping. AVOID approaching closer than 100 metres/yards to any marine mammals or birds. PAY ATTENTION and move away, slowly and cautiously, at the first sign of disturbance or agitation. 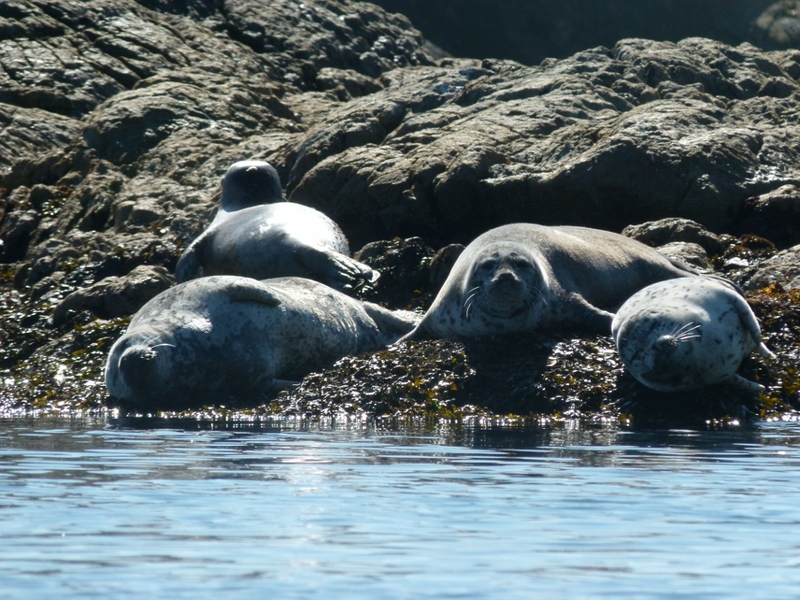 DO NOT disturb, move, feed or touch any marine wildlife, including seal pups. If you are concerned about a potentially sick or stranded animal, contact your local stranding network where available. For full information please visit www.bewhalewise.org. The biggest concern for kayakers is seals, sea lions and ocean bird life. Because we are so close to Seal Island which is a harbour seal nursery and breeding colony from July to September we are able to have some amazing wildlife encounters with both adult and baby seals. We have the opportunity to kayak past moms and pups nursing on the rocks as well as hunting in the water. There is a good chance the seals will venture close to the kayaks. Being familiar with the guidelines will help paddlers to safely and respectfully enjoy the wildlife in the area. If you happen to see wildlife that is injured or in distress you can contact sightings@vanaqua.org via email or call 1-800-465-4336 to report your sighting.